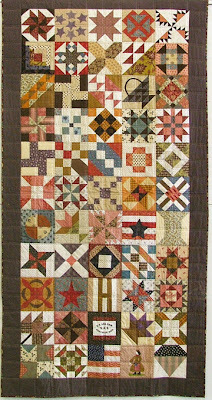 Sandy F from Oregon sent a picture of her finished sampler. "I have to say I loved doing the civil war block each Saturday. After some thought I decided to go with a very simple setting, something a lady in those times might do. I had read an article about the Sanitation Com. 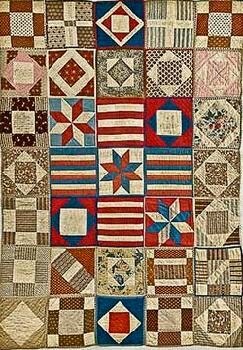 requesting quilts that would fit cots. They wanted them 48" x 96". So this is the size I made mine." 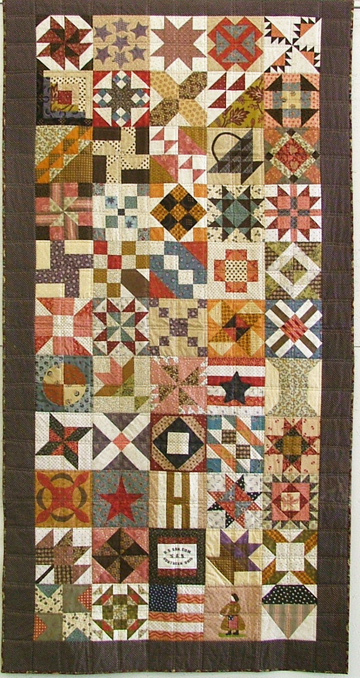 Sandy's inspiration: samplers of blocks without any sashing made by Ladies Aid Societies. 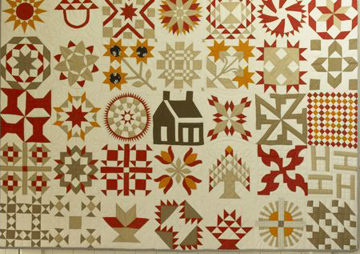 This one is from the collection of the New England Quilt Museum. What looks like sashing is actually the binding of individually bound and quilted blocks whipped together. "I added three additional blocks to get the right amount. " So her sampler is 11 blocks long by 5 wide = 55 blocks. "I found this patch thru an online store and fit right in with my plan." 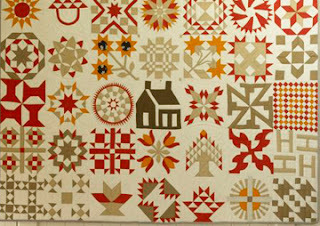 Here's another side-by-side sampler with blocks of different sizes from the same time period. The side-by-side set, especially when the blocks are sized differently, creates an energetic, informal look. Thanks for the pictures, Sandy. It's a great look! I love how she did her quilt and the added touch of Jeff Davis' Daughter. I finally made my first one, it is on my blog. I am fabrics from the layer cake for her dresses. 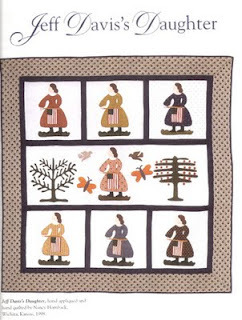 I love the setting and the history behind the setting...it makes the quilt come alive! 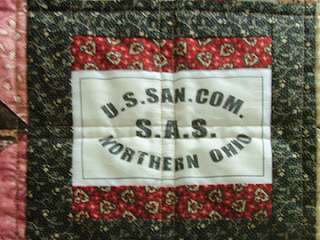 Sandy from Oregon - I love love love your quilt! It makes me smile that you made it into a cot sized quilt. I love it! 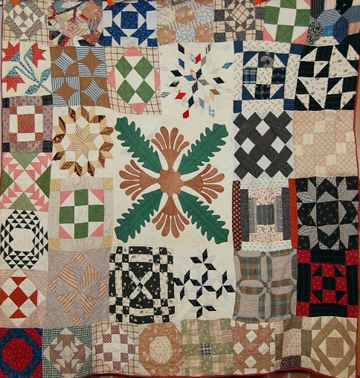 What a great setting, using history to determine your quilt's look - great work!!!! I like it a lot!!!! I have yet to see one setting I don't like! I have misplaced 20 of my blocks, so I might be making them all over again!